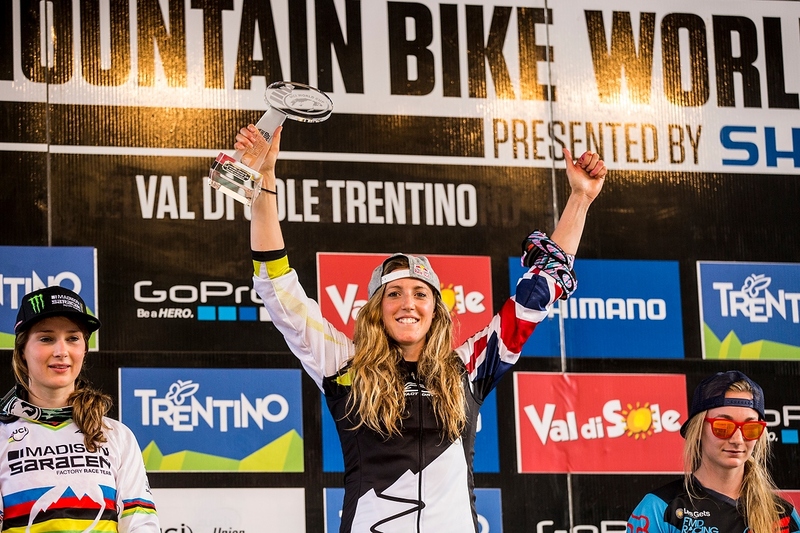 Rachel took the win over the weekend at her beloved Val di Sole. She had already secured the Series Overall so this 6th win out of 7 (she was 2nd to Emmeline Ragot in World Cup Round 1 at Lourdes) was an added bonus. 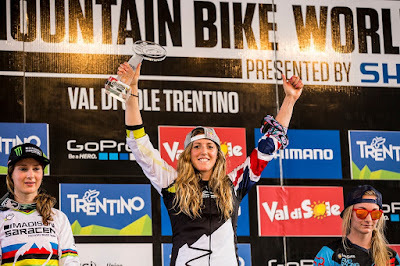 This was Rachel's 26th World Cup win, extending her claim to be the UK's most awarded mountain biker. Val di Sole is notoriously brutal; it's often hot, very dusty, plus it's long and physical. Friday's Qualifying Round was close with Rachel in 1st and Manon Carpenter just over two seconds back. 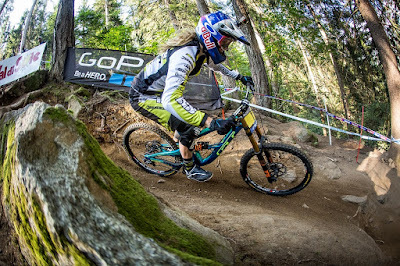 Myriam Nicole was back on track after breaking her collarbone at Fort William BDS and staked her claim just 0.3 seconds behind Carpenter. By the time the women came on track for Finals there was deep dust, huge nets of exposed roots and a lot of holes. Fourth qualifier Tahnee Seagrave had a narrow escape with a big hole in the top section but held on to go into the hot seat by 2.5 seconds. Just three to go. Myriam Nicole, 3rd place qualifier, had clearly got her bike set-up dialled. She looked very stable, going up 1.6 seconds on Rachel's qualifying time at split 1. She was up a huge 9 seconds on Tahnee at split 2 and maintained that gap with a scorching lower section to take the hot seat by 9.1 seconds, over 3 seconds faster than Rachel's qualifying time of 4.14.283. Then Manon was on track. Manon was almost 5 seconds back at split 2 but carried good speed through the bottom section; it was not enough to catch Myriam and she went into 2nd place by 4.1 seconds. Rachel has talked about how exhausting she finds Val di Sole and had promised to go all out in the top section. She was true to her word, attacking straight out of the start gate and putting together a blistering run to take the win by 2.2 seconds, her 6th consecutive victory of the Series. Rachel said: "There were some very sketchy moments in there! I almost forgot about the racing trying not to crash! I really wanted the win here today but I knew that it wouldn't be easy. Manon and Pompon (Myriam) love these long tracks, and as the season goes on they are getting so fast - I'm scared for Andorra! So proud of the GB women for our top three in the Series." The results for the Women's Series overall were a fantastic run for the UK with Rachel in 1st, Manon Carpenter in 2nd and Tahnee Seagrave in 3rd. Cause for a huge celebration! In the Men's race Troy Brosnan, Aaron Gwin and Loic Bruni had qualified within 1.3 seconds of each other and three seconds clear of the rest of the field. Greg Minaar was in 4th and Gee in 5th +4.6 seconds back. Taylor qualified 30th. In the Series Overall it would be between Gwin and Minaar. 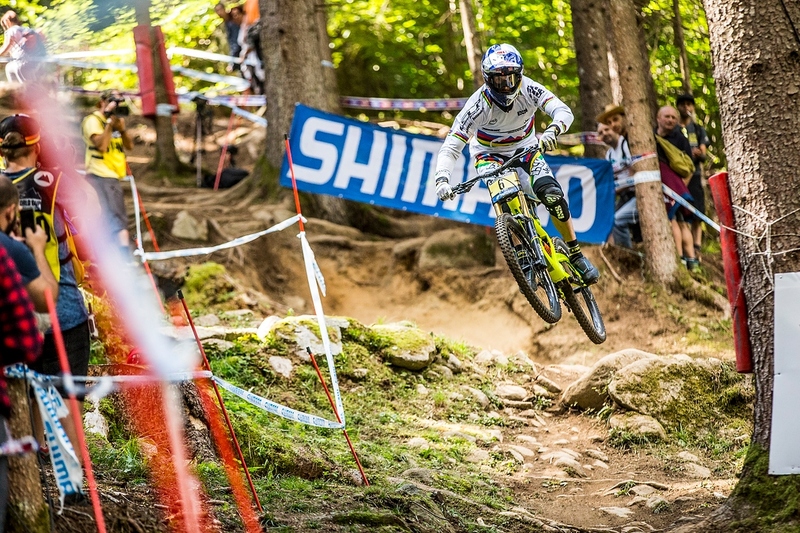 The top men were all absolutely flat out, especially through the steep lower sections of Val di Sole. Taylor battled some serious arm pump to finish 41st today, enough for 47th in this year's Overall rankings, his first year in the Elites! When Gee came on course, Brook Macdonald was in the hot seat with 3.35.215. Gee had won here at the 2008 World Championships and had "done the World Cup double" with Rachel in 2013. He came out of the start gate 100% committed and rode a fantastic top section, looking really smooth. Gee went around the braking bumps and great line choice put him up 0.5 seconds at split 1. He continued to ride very smoothly taking the most direct routes down the hill to go just over 0.5 up at split 2. He hit a few little holes on the last left-hander to cross the line 1.2 seconds back on Brook whose lower section looked very fast indeed. Then Greg Minaar was on track; a spill at the Wall ended his chances of the overall win and he crossed the line in 51st. Loic Bruni went fastest at split 1 by 1.5 seconds, up by nearly 2 seconds at split 2; he crossed the line still fastest to take the hot seat. Aaron Gwin was last but one to go. 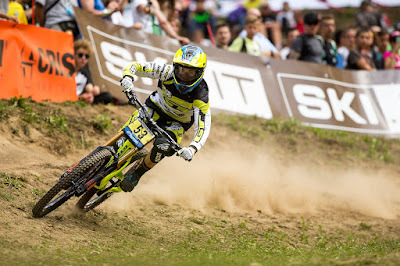 With the pressure off, Gwin rode a brilliant race to go up at split 1 and take the lead by 1.589. Last man down Troy Brosnan was up at split 2 and the crowd went wild but a few small mistakes lost him time and he slotted into third. Gwin took the win and the Series. Gee's 6th place today was enough for 6th place in the Series Overall. This is the first time he has been out of the top 5 since 2005. Gee said: "I'm disappointed. The crash that I took in qualifying at Round 1 at Lourdes and the ride down after that in the Finals with my wrist strapped to the bars [miraculously he somehow finished 48th] left me chasing from behind for the entire series. Congratulations to Gwin, he rode a great race and an awesome season." In the Team Overall Standings, GT Factory Racing narrowly missed out on the Overall title to Specialized Racing. Team Director Dan Brown said: "All of us are gutted to miss the Team Overall by such a small margin. The team put in a mammoth effort all season and it's a shame to come so close, especially with us being in the lead as we came into this round. Next year it will be a different story."